Here are some of the projects I have been working on over the last couple of years. I try to keep this page as up to date as possible with information on what I'm doing. Most recent projects are at the top. All information is free to share as long as it is properly cited. To the left is a list of the projects housed on this page with jump links to the relevant position on the page. 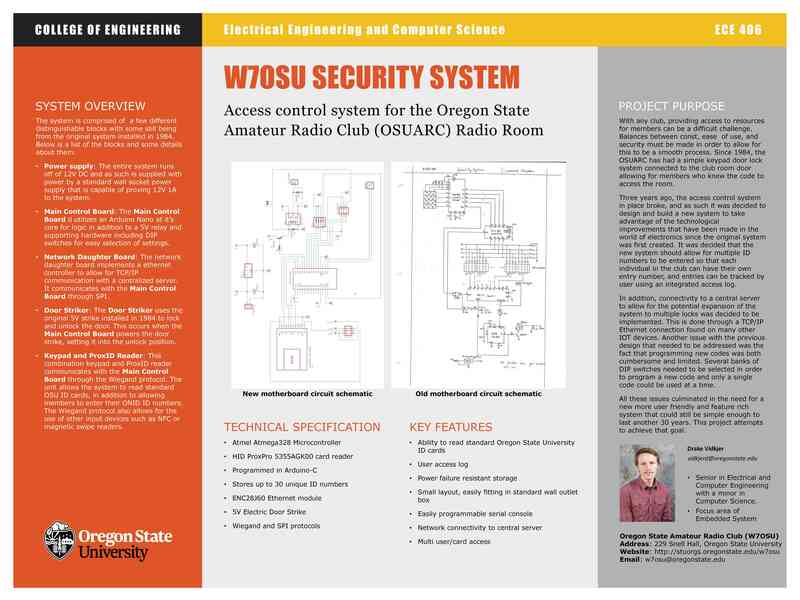 To fulfill the final credits required for my Electrical Engineering degree at Oregon State, I took it upon myself to design a new access control system for the Universities Amateur Radio Club, W7OSU. I was able to make this into a project work upper division credits with the sponsorship of my Senior Design instructor Don Heer. The project started out at two credits, though this was eventually changed to six credits in order to reflect the amount of work put into the design and construction. With any club, providing access to resources for members can be a difficult challenge. Balances between cost, ease of use, and security must be made in order to allow for this to be a smooth process. Since 1984, the OSUARC has had a simple keypad door lock system connected to the club room door allowing for members who knew the code to access the room. Three years ago, this access control system broke, and as such it was decided to design and build a new system to take advantage of the technological improvements that have been made in the world of electronics since the original system was first created. It was decided that the new system should allow for multiple ID numbers to be entered so that each individual in the club can have their own entry number, and entries can be tracked by user using an integrated access log. The door lock itself is built around an Arduino Nano microcontroller board. The decision was made to use an Arduino board instead of a standalone microcontroller such as the Atmega328 because of the added features of the Nano such as the USB to serial interface and integrated regulator, all in a small size compared to through-hole components. A secondary regulator on the board allows for different voltages to be supplied to the door strike which is controlled through the relay circuit. Communication between the ID card reader or keypad and main board is done over the Wiegand protocol, and industry standard access control protocol which allows for long transmit distances. Headers are also provided for serial communication for things such as Bluetooth and a jumper configurable relay override is also provided which allows the door to be opened with an external power source in the event of a power outage. Settings such as programming mode and server authentication are set using the five DIP switches on the board. The door strike mechanism can be implemented in many different ways though generally it is done using a 12V solenoid. A SPI header and standoff mounting points allow for an Ethernet module to be installed providing server authentication. For software the Nano is programmed in Arduino-C, with plans to recode the system in pure C for better optimization. In standalone mode, the door lock can hold up to 30 non volatile ID numbers of up to 9 digits each. These numbers are stored in EEPROM and can survive power failures. The system also includes a volatile access log and time which must be set through the serial terminal upon reset or power cycle. Information about the system such as time, access log, whitelist and adding/removing can all be accessed through the serial terminal which is connected to a computer through a mini USB cable. Programming can also be done with the DIP switches located on the board, allowing for both adding and removing of ID numbers through the keypad or ID card reader when the system is set into programming mode. When in server authentication mode, the system will query a server through UDP over the Ethernet connection when an ID is entered onto the keypad or ID card reader. The server then sends back either a granted or denied message and both the server and system log the transaction in their respective access logs. When first starting up, the door lock will receive an IP address from the DHCP server, which in standard configuration is running on the same system as the Access Control server. This computer also runs an NTP server which the door lock queries to update the internal clock of the system. If the door lock queries the server and does not receive a response within a specified time then it will use the system on board whitelist. The Access Control server is written in C++ and runs on any Unix like system that also supports running NTP and DHCP servers. All network traffic is unencrypted UDP so it is highly suggested that the server and any connected door locks be run on a separate LAN network disconnected from the Internet and any other devices. At this time I am not releasing schematics or code for the system but bellow are images of the door lock installed in the W7OSU club room as well as images of the PCB and assembled system. For my degree in Electrical Engineering at Oregon State, we are required to complete a senior design project. This is a year long design challenge where we work with a stakeholder to develop a product from simple requirements all the way to a completed product that we can show at the Engineering Expo at the end of May. This is an ongoing project , and as such, information here will continuously change. Most information though will be located at our Senior Design Project Site, whose link is down below. My team's product is a bike power USB charger, capable of converting the mechanical energy of riding a bike into power that can be used to charge a USB device such as a phone or table. The design provides an output of at least the minimum USB specification of 500mA, with plans for a higher output as well as an internal battery to allow continued charging even when the bike is not in motion. Our team consists of myself and two other Electrical Engineering seniors and our stakeholder is a PHD student in the Electrical Engineering program at Oregon State. At this point, we have a block diagram complete, along with designs and prototypes for certain internal components. The system also has a companion Android smartphone application that is capable of reporting power generated by the device over time. One of my favorite engineering courses at OSU was ECE 473, Microcontroller System Design. This course was taught by the wonderful Roger Traylor, and following with his style, was a dive right into the deep end of microcontroller design. The course saw students writing firmware for an Atmega328 Development board in pure C, making use of an ever growing number of ports and protocols as the course progressed. This culminated in the design of an alarm clock with a built in radio allowing for music to be played when a specified time was reached. Bellow are photos of my completed alarm clock and a link to all my relevant files for the course. As with many of my projects, the system centered around an Atmega328, this time on a development board also used for other courses in my time at Oregon State. The screen is controlled using a shift register and is encoded in hexadecimal, as is fairly standard with seven segment displays. The rotary encoders are controlled through interrupts and a number of pins that can decode the position of each encoder. The buttons, arguably the simplest input of the system, are controlled through polling, being checked every clock cycle. Output is sent to an indication light bar using the SPI protocol, and control of the radio board is done using I2C. Managing to get everything to work in harmony is something wonderful to see, and to feel knowing what all is going on behind the scenes.